Over the holidays, I committed myself to cleaning out the house; kind of like a spring-cleaning in the winter. The New Year was approaching, and I wanted to start a lighter, fresher more unencumbered year. And since there were closets and cabinets I hadn’t tended to in quite a while, I figured it would be the perfect time to go through things and reorganize the house a bit. The project took me a few days, but I was determined to start at one end of the house and work my way through to the other side. It actually began as quite a liberating experience. I emptied closets and dusted shelves. I donated things I didn’t even know I had and trashed things I no longer needed. I kind of enjoyed the process and eventually was really to tackle my walk-in closet. of my husband’s drawers. It was one of those knick-knack drawers, with an assortment of different things that didn’t really belong anywhere in particular. I could tell he had just thrown things into it over the years and hadn’t really opened it in a while. But all the way on the bottom, underneath an old college sweatshirt and an ugly scarf was a sealed white envelop. I recognized his handwriting instantly and I even recognized the addressee. As I picked up the letter and held it close, I found myself sliding to the floor, tears welling in my eyes. The enveloped looked a bit old and weathered, as if written several years ago. It seemed like he had stuffed it in the bottom drawer and forgotten about it. I was confident it was his writing because I too had received my share of these love letters. As I sat there, wondering what he had written, I knew I had a decision to make. I could either approach my husband about the letter; I could deliver the letter to its intended recipient the next time I saw her; I could put it back where I had found it; or I could rip it open and read through it…. I decided to place the letter back in the drawer, lay the ratty old sweater over it, and leave it be. I’ve always known my husband to be an eloquent writer who enjoys expressing his thoughts and emotions on paper because I have a shoebox full of old love letters, birthday cards and post-it notes that he has given me over the years. I just didn’t know there was anyone else who received these kinds of expressions. My tears weren’t those of anger, disappointment, or even sadness. 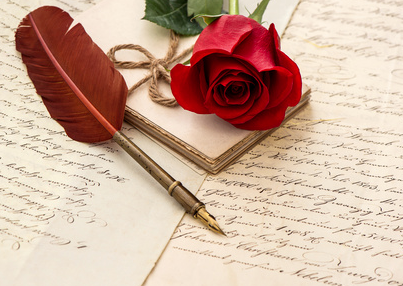 They were the emotional expression of knowing how sentimental and precious such a letter is. his most honest thoughts and feelings, his desires and fears, his hopes and dreams. But interestingly enough, he sealed the letter and hid it where no one would find it. Even more interesting is that the letter has an intended delivery date—less than one year from now. You see, our daughter was merely a child when my husband wrote this letter to her, and it seems as if he is waiting until her 16th birthday to delivery it. I know it won’t be the only love letter she ever receives, but I hope it is one she will cherish forever. We are loving what you write !! So sweet!! I did the same for my son on the day before he started preschool! I actually just read the letter to him at his Bar-Mitzvah! It’s very emotional. People are still telling me how much they enjoyed listening. You touched my heart with this note. I wish my dad had written a letter for me somewhere so I could read it one day! Just keep writing. Love to read your notes. I have to say, I almost started crying reading your post today. It was so well written and a very captivating piece. You guys are great parents. I have written hundreds of pages for my girls as they were growing up. I had no one to tell me anything about my childhood and I wanted to make sure they knew theirs. I’ve been wanting to write more now, and this just inspired me. My friend did a new thing, he opened an email in the sons name, and is sending him emails. He will give him the password when he is 16. It’s a great way we can all do something! Just a thought. I love that your girls will receive such a valuable gift, and that you have been inspired to begin writing again. They will be so grateful when they receive this. Writing emails is a great thing that many people do….I’m just old school. I like the idea of being able to hold the paper, and read and re-read it over the years. You keep amazing me with your beautiful writings. I must say if your intention was to put the reader through an emotional roller coaster you completely succeeded. Although I love each & everyone of your writings, I have to say this one touched me in an amazingly powerful way. You truly are a gifted writer. Your post is a gem. I read your pieces with pleasure & enthusiasm. Thank you for your openness & genuineness in the thoughts & feelings that you share!!! !